Without light, microgreens remain merely micro and never turn green. But what light? Obsolescent incandescent (tungsten) bulbs generate as much heat as light, so can be too close for comfort. The same is true for compact fluorescent bulbs (CFL). While not hot, their light is too closely focused. Fluorescent tubes emit more light than heat, and more evenly dispersed light, so have long been used for indoor cultivation, but their wattage is limited. Thanks to a flourishing market for indoor cannabis, lighting technology has undergone great innovations. Advances are led by digital ballasts that moderate higher wattages than do magnetic or electronic ballasts, yet they do so with less bulk, less weight, less heat, and less electricity. These newer ballasts in turn electrify a new breed of high-output lamps that include light-emitting diodes (LED), high-intensity discharge (HID) metal halides (ML), and HID high pressure sodiums (HPS). While all of these illuminate better than does incandescent, none can rival the Sun (SUN!). Artificial light promotes clearly measurable plant growth even when its color temperature varies widely from sunlight. Contrary to most folks’ assumptions, seedlings grow just as well when illuminated with standard cool white fluorescent lamps as with full-spectrum grow lights of equal wattage. A fuller spectrum is necessary to spark flowering and to fertilize seeds and to nurture fruits, but not to promote the growth of young seedlings. 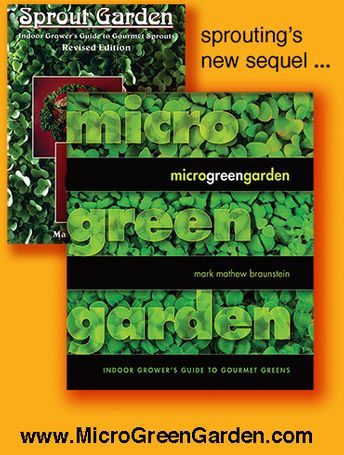 Microgreens are the Peter Pans of the plant kingdom, singing elegies to never growing up. So if you already own standard fluorescents, for instance for your reading lamp to illuminate this very page, go ahead and use what you have for growing microgreens. Or if you already own full-spectrum bulbs and have used them so much that they have lost their fullness, rather than replace them, again use what you have. Collectively, all of the above can be called grow lights. While it is very easy to grow heavy with grow lights, your supplemental lighting need be neither elaborate nor expensive. Some costly setups consist of stands from which the light units are suspended on chains so the height of the lighting can be adjusted to hover closely above the plants as they grow. Cast away those chains! All you need do is prop the trays atop varying sizes of empty cardboard boxes. If it hovers closely over your greens, a single fluorescent tube can suffice. Though too quickly for the human eye to notice, fluorescents constantly flicker. Thus the industry standard are fixtures that house double tubes, so that the light of one tube fills in the gap of the blink of the other tube. Two tubes are better than one, but better still is tubeless. Unlike the tubeless tires on automobile wheels whose treads wear away, the sun is tubeless and never tires. First some definitions relevant to our discussion about sunlight. Direct light and direct sunlight and full sun are synonymous terms. Ditto indirect light and indirect sunlight and shade. Sunlight is natural and free, while your utility company charges for their charge. A lifestyle “off the grid” is commendable, but life on the electrical grid can be environmentally sound, too, if you limit your use of it. If just one of your windows provides direct sunlight for at least half the daytime, that is enough light for growing most microgreens. 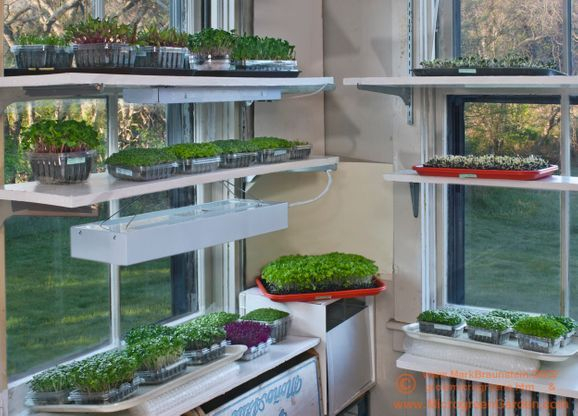 If that is not enough windowsill for your many trays or containers of microgreens, then construct shelves. Your one-time investment in pinewood and metal brackets will be compensated by constantly recurring savings in your monthly electrical bills. Sunlight both direct and unfiltered by glass is an ideal toward which to aspire. Though glass filters out most of the ultraviolet spectrum of light, microgreens can flourish without a full spectrum. A single-paned window can act like a magnifying glass and create a hot house behind it, so in cool weather glass can be a friend to microgreens. But if that light shines upon a small, confined space with poor ventilation, then in hot weather glass can bake microgreens. Yet exposing seedlings to direct summer sunlight outdoors also comes with risks because of the sun’s heat rather than its light, and the compounding parching effect of warm wind. If you provide ample moisture and windward shelter, then most seedlings thrive under direct sunlight. With sufficient sunlight, micros grow not so much tall as wide. Do not confuse indirect light with insufficient light. Indirect sunlight can suffice. That is how intense is sunlight. But insufficient light spurs height, not strength or vigor, and does not create the deep green color that is the visual marker of chlorophyll. Still, some shy seedlings do well under indirect sunlight. Signs of heat exhaustion in plants are wilt despite ample water, and signs of sunburn are dabs of discoloration on leaves similar to the sun spots on your grandpa’s face. These are the exceptions, not the rule. Hot weather and hot sun will cause greater discomfort to you before it will stress most micros, so use your own body as a gauge. We live on the Earth, but we live by the Sun. The Sun grows our crops, warms our bodies, defines our seasons, and measures our days. Sunlight is the gold standard for light quality, but what about its quantity? At the equator, daylight spans 12 hours a day, every day. At Latitude 40 degrees North, an imaginary line that traverses New York City and Salt Lake City and skirts Vatican City, daylight lasts more than 16 hours on June’s first day of summer, but barely 10 hours on December’s first day of winter. Winter light compared to summer light certainly is shorter, and also is weaker. Nowhere on the planet does the Sun shine with the full intensity of summer sunlight at noontime but throughout the day. So you need not attempt to simulate or achieve that. Instead, think of your electrical lights as providing transitional twilight rather than noontime sun. Resort to artificial lighting as a supplement to, not substitute for, natural sunlight. Winter light compared to summer light not only is shorter, but also weaker. So only during winter might you need to extend daylight hours with artificial indoor lighting. So how long is your daytime? For your sunrise and sunset times, consult your daily newspaper, an almanac, weather websites (Time and Date dot com < www.timeanddate.com > has it all, including a Sun Calculator to create charts for your locality), or just look out the window. For dawn, subtract one-half hour from sunrise. For dusk, add one half-hour to sunset. Next, count the hours from dawn to dusk. For most garden vegetables,10 hours per day of mostly direct sunlight or 14 hours of mostly indirect sunlight can suffice. While this tally applies to all stages of vegetative growth, it is less crucial for microgreens. Under weak winter sunlight or indirect summer sunlight, microgreens may need more days to grow, but they still will grow. Seek the light! Exposed to insufficient light, seedlings grow long and frail stems in a fruitless attempt to reach for more light. Gardeners call this sad state legginess, which sounds like baby talk, while botanists call it etiolation, which sounds like cancer talk. Let’s just call it long and frail stems. Avoid growth of long and frail stems because stems generally are tough or bitter, while leaves tend to be tender and sweeter. Conduct a taste test. Go to your fridge, and remove from the vegetable bin one large lettuce leaf. For this test, romaine lettuce serves well, butterhead and looseleaf lettuces suffice, but iceberg lettuce not. If you wish, wash the leaf. Now trim away the flexible outer leaf that generally is a deeper color green, and retain the stiff central spine whose color generally is off white. Now eat only that outer leaf. Tender, succulent, maybe even sweet! Nice! Okay, next eat the remaining central spine. Fibrous, bland, maybe even bitter! Not so nice! Let’s talk sunflower, whose very name is very sunny. Some indoor gardeners find that their sunflower greens grow long and frail stems. To prevent this they extend the initial stage in darkness by one or two extra days. During this darkness stage (its recommended duration two or three days), they place a plate or some other sort of weight atop a tray which itself rests atop the sunflower greens. Weighed down, the seedlings grow stems that are strong and squat. But the plants are seeking the light of the sun, not the extra days of darkness under the weight of a plate. The problem is lack of light, not lack of weight. So instead of growing stems that are long and frail and fibrous and bitter, under pressure such un-green sunflower greens grow stems that are short and squat … and fibrous and bitter! Conduct that same lettuce taste test upon sunflower greens. Take a handful, snip off just the leaves with your fingers or your teeth, and once you have a handful of leaves eat only those leaves, but not the stems. Tender, succulent, even sweet! Again, nice! Next, eat just those leftover stems. Relatively tough, maybe bland, or maybe even bitter! Again, not so nice! The leaves, not the stems, impart the delicate and agreeable flavor that makes sunflower greens so highly prized. The smaller their leaves, the lesser your prize. Chlorophyll in leaves converts sunlight energy into plant matter, which mostly are sugars and starches but also all other plant nutrients. Chlorophyll imparts the green in vegetable greens. Deep, dark green in leaves indicates richer chlorophyll content. More chlorophyll signals the plant’s potential to produce more sugars and all its other phyto-nutrients. More sugars and more nutrients result in more flavorful and nourishing veggies. Thus the goal is to grow lush leaves, not long stems. Simply stated: leaves, not stems. If your taste buds are dulled by a lifelong assault of white salt and white sugar, you might not discern any difference in taste between micros grown in sufficient direct sunlight and those grown mostly in indirect sunlight or shade. In that case, you could seek empirical evidence and send your two batches of microgreens to a lab for chemical analysis. Or for less than the fee for a single laboratory analysis, you can purchase a BRIX meter, also called a refractometer. A single BRIX, also notated as Bx, is a measure of plant sugars, just as a calorie is a measure of food energy. Agronomists attest that sugar content is a predictor for the broader spectrum of other nutrients as well. Ultimately, a refractometer measures how much light has shone upon your microgreens, which in turn reflects upon your gardening skills and whether you have met your gardening goals. Your goal is to grow lush leaves, not long stems. You might repeat this as you would a mantra: Grow Lush Leaves, Not Long Stems. Long hours of natural sunlight do reach a natural limit, which is a good thing. Artificial light can artificially exceed that limit, which is a bad thing. More and more light does not necessarily produce more growth or more nutrients. Just as you need at least six hours of sleep, plants need a minimum of six hours of darkness. Yet plants do not rest at night as we do. Instead, after a day creating carbs, during the night plants metabolize and convert those carbohydrates into plant tissue. They deepen their roots, thicken their stems, and broaden their leaves. In essence, plants work hard by day, and grow strong by night. In an effort to maximize yields, some indoor gardeners shine their artificial lighting 24 hours a day for the last two or three days before harvest. With uninterrupted light and no darkness, seedlings continually create their starches and sugars, but only minimally metabolize them. Imagine stuffing yourself with foodstuff all day long and all night long, but never exercising and never sleeping. Yet you still will grow. You will grow fat! Such obesity is a measure of quantity, not of quality. Plants exposed to round the clock light become stressed. If for only two or three days, they may not yet visibly manifest their stressed state, but they are stressed nonetheless. Microgreens and mature greens grown under light round the clock cannot provide us with the same level of nutrients as those whose schedule more closely resembles that of nature. If you are inquisitive, grow one batch of sunflower greens under perpetual light and another under light alternating with darkness. Send them off to a lab, or analyze them with your handy BRIX meter, or just taste them! Their tastes will be so distinct that even the most jaded of taste buds will discern the difference. But why bother? We already know that nature knows best, and therefore should have faith that nature grows best. So provide your homegrown greens with the light of day, but also with the darkness of night. To sum up: assure at least six hours of darkness, and seek at least ten hours of light. And while direct sunlight fosters the most succulent growth, indirect sunlight can suffice. Reflected Artificial Light. Reflectors can intensify artificial light. Create reflectors with lightweight white cardboard. (Hint: undersides of produce boxes often are white.) The deluxe model is white foam core board purchased from office or art supply stores. Aluminum foil affixed to cardboard is more reflective than white, but unsightly. The hi-tech version of foil is metalized mylar, a plastic film embedded with aluminum. Some well stocked gardening stores carry metalized mylar, as do sporting goods and camping equipment stores. Camping stores call metalized mylar space blankets or survival blankets. Trim the boards to preferred size, and prop them upright around the microgreens. This creates a lightweight light box that is collapsible when not in use and easy to store when out of sight. Reflected Sunlight. Our most familiar form of reflected sunlight is the moon. Upon further reflection upon the subject of reflection, you might strive to provide light that is more intense than sunlight. But what light can possibly be more intense than the sun? Two suns! When sunlight shines through your windows directly upon your microgreens, prop some reflectors to the sides of and behind the microgreens. Merely one reflector in back works wonders. Boards are easy to prop upright if you create a fold two or three inches (50 or 75 mm) from one edge, and slide the fold under the tray of microgreens. Of everything we eat, green leaves contain the greatest concentration of sun energy. One way to see the light might be to eat it, in which case spirituality just might boil down to a question of energy. Nations go to war over land and people become gluttonous or ravenous for the food that grows upon it, but sunlight which creates that food seldom is in short supply. Sunlight shines upon us all. It is no coincidence that Christianity’s day of worship and the Western world’s day of leisure both fall on the day named for the Sun. May all our Sundays be sunny and may all our days be Sundays!